Following police brutality allegations, MK urges end to British Mandate-era practice of imprisoning or distancing suspects without charge. 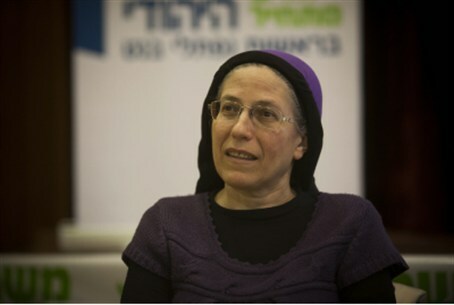 Israel must stop using administrative orders to hold suspects, or distance them from their homes, without bringing charges, MK Orit Struk (Bayit Yehudi) has urged. Administrative orders are often used against Palestinian Authority resident Arabs suspected of terrorism. They have also been used against Israeli Jews living in Judea and Samaria (Shomron) who are suspected of confronting Arabs or engaging in counter-government activity. Several men who have been given administrative distancing orders have accused the government of abusing its powers and of using the orders to mete out revenge for what should be protected political activity. The issue made headlines late last week when a video surfaced showing the violent arrest of Boaz Albert, a wine-maker and father of six from Yitzhar in Samaria. Albert was dragged from his home and arrested for the crime of having come to visit his wife and children despite an administrative distancing order prohibiting him from entering the region. MK Struk, who founded the Yesha (Judea and Samaria) Human Rights Organization, noted that the subject of administrative orders is one that both left and right-wing Israelis can agree on. A Knesset recommendation in 2007 to cease use of administrative orders won support from across the political spectrum, she recalled, with both the National Union faction and Meretz voting in favor. In the 2007 vote, MKs agreed on the statement, “The Knesset asks law enforcement agencies to conduct investigations and trials for any Israeli citizen suspected of crimes. There shall be no use of restrictive orders, administrative arrests or other means that constitute punishment without trial, except in exceptional cases in which there is clear cause to fear harm to state security. “The Knesset will follow up and provide oversight on security forces and the legal system to ensure they uphold this policy, as befits a democratic state that values the principles of natural justice,” the statement concluded. Struk is asking her fellow MKs to vote again for the same measure, to send a clear message that Israel’s leaders do not support widespread use of administrative measures. “The principles of human rights that were accepted by the Knesset in 2007 will of course be acceptable to members of the current Knesset, which is a Knesset that seeks to defend human rights,” she added.